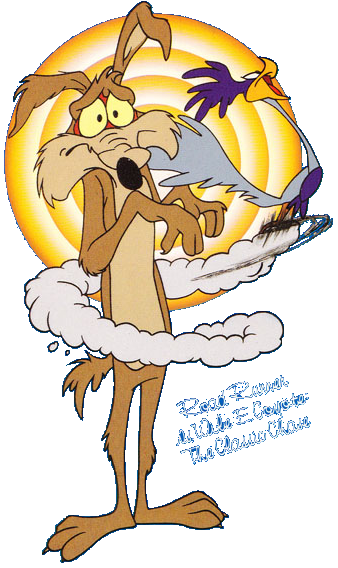 When it comes to The Chase, no one’s been at it longer than Wile E. Coyote and the Road Runner. Director Chuck Jones and writer Michael Maltese dreamed up their first fast-paced adventure in 1949; it was called Fast and Furry-ous and it set the pace for 20 years of backfiring blackouts. It’s unusual for a cartoon series to survive so long—and deliver so many laughs—when each episode sticks to the same exact formula. But this is not a case of mere repetition; it’s comic pursuit raised to the level of a classical ritual. And besides, Jones and Maltese always have a surprise or two up their sleeves! Speaking of surprises, there are a few twists and turns in this program as well: the inclusion of Operation: Rabbit, in which Wile E. Coyote matches wits with Bugs Bunny, and Ready, Woolen and Able, one of the hilarious offshoots of the Road Runner series with Ralph Wolf (who looks suspiciously like Wile E. Coyote) trying to outwit Sam Sheepdog before the 5-o’clock whistle blows. So fasten your seat belts—Acme Seat Belts, of course—for a wild-and-woolly adventure, as the most determined predator in cartoon history (Eatimus Anythingus) takes off after the fastest prey in the American West (Accelerati Incredibulis).